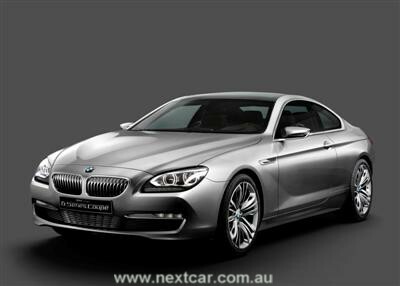 Sports driving pleasure and exclusivity in a premium-class 2+2 seater are redefined in the BMW Concept 6 Series Coupé. This concept study, to be unveiled for the first time next month at the 2010 Paris Motor Show, underscores the brand’s prowess in building sporty, elegant coupés. At the same time, the concept car paves the way for a new interpretation of a vehicle category that is defined by aesthetics and dynamics. The BMW Concept 6 Series Coupé also expresses the sportiness that derives from engine and chassis competence through its design. The concept model reveals the styling cues of a BMW coupé, such as a long bonnet, short front overhang, a passenger compartment that is set well back, a long wheelbase and a low-profile silhouette with a dynamically flowing roofline. The principal bodywork lines extend over the entire length of the concept car, while the various body sections meld together as if made of one piece. The precisely defined lines shape the structure of the bodywork surfaces, following the alternation of concave and convex contours. The counterpoint between the lines and surfaces gives the BMW Concept 6 Series Coupé a naturally sporty aura. This interplay of linear and sculpted forms is inspired by the wave motion on the surface of a sea exposed to the winds and the tidal ebb and flow. Among the arresting details of this concept study are newly developed headlights featuring LED technology. The full-LED headlights, introduced for the first time on a BMW, produce a strikingly bright white light that makes for particularly intensive and precise illumination of the road. In addition, they incorporate adaptive headlight functionality. The daytime driving lights, which also take the form of LED rings, further accentuate the characteristic, unmistakable front-end styling. The typical L-shaped rear lights of the BMW Concept 6 Series Coupé establish a visual link between the sides and the rear of the vehicle. Inside the units, two LED-powered light strips provide the familiar BMW night-time look, an effect enhanced by the L-shaped lower light unit. The direction indicator, tail light and brake light are likewise LED-powered. The interior of the BMW Concept 6 Series Coupé is defined by functionality, elegance and exclusivity. Furthermore, the driver-centric concept so typical of BMW – and a key hallmark of a sports coupé – is executed with stylishness in the design of the centre console area. A further innovative accent is provided by the freestanding, 10.2-inch control display of the iDrive system in the centre of the instrument panel. The concept car also boasts the head-up display familiar from BMW series models, offering functionality that is unrivalled worldwide. Maximum listening enjoyment is guaranteed by the hi-fi system specially designed for the BMW Concept 6 Series Coupé and featuring high-quality components from Danish audio specialists Bang & Olufsen.